As a parent of two sophisticated daughters, I am attempting to help them live the best lives possible. What that means is open to interpretation, but I know I want to expose them to as much as I can and hope they find a passion in their life or things they enjoy because those are precursors to fulfillment, or what many call "happy, happy, fun, fun, happy, happy, fun." One difficulty I have encountered, though, is when to stop my children with a problem activity. Now, I consider myself extremely open-minded and willing to support my children in any endeavor they chose, including art, science, sport or whatever they happen to feel is important. But what should a parent do when the child's activity is potentially destructive? Luckily, some parents never face such a question. But I have faced a tough question with my youngest daughter, Chloe, who yearns to be the next Kobayashi - the greatest eater of all-time. She calls herself "Chloe-ashi." Chloe-ashi, 2, can eat a hot dog in less than one minute. If she hones her hot dog eating skills, there is a chance she, one day, could vie for the Nathan's Hot Dog Eating Championship in Coney Island on a faraway Fourth of July. 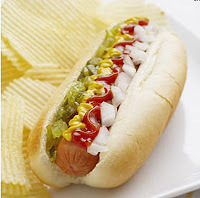 But is eating more than 50 hot dogs in 10 minutes truly healthy? Well, I don't think eating numerous hot dogs quickly is healthy, so I am not encouraging Chloe-ashi to eat her franks so fast. OK, I am not discouraging her, but I will not encourage such activity. Apparently, Kobayashi is having difficulty with this Joey Chestnut character. Kobayashi last won the big Nathan's contest in 2006, then Chestnut won the past three years. However, ESPN's best ratings for the contest came in 2006 for Kobayashi's last victory. I believe that ESPN's ratings with the power eating is lagging because fans prefer Kobayashi, a thin gentleman, to Chestnut, who is plump.